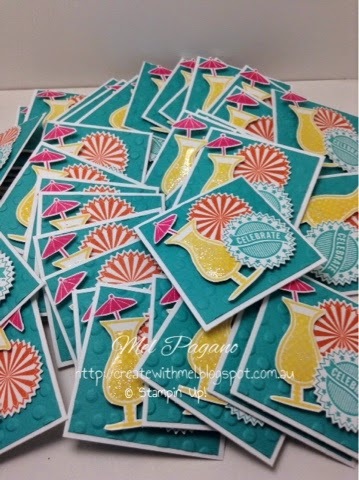 I am part of an absolutely AMAZING Stampin’ Up! Team called the Eureka stampers. I have never seen such support and friendship develop so quickly before. We are a fabulous team to be a part of. Good question! A twinchie is a two inch square decorated that you can then pool together in a frame or on a card front, etc…. Traditionally and inchie – our team made a twinchie 😉 Our theme was the bright colour range and a party theme. I had so much fun making these…. 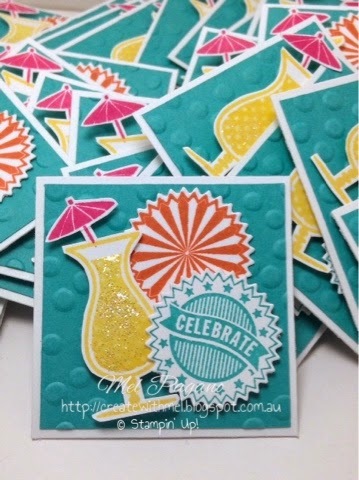 40 white card bases; 40 embossed Bermuda Bay squares; 80 starbursts in Bermuda Bay and Tangerine Tango (those colours go amazing together) and a glass from the Happy Hour Stamp Set inked in Daffodil Delight, filled with crystal effects and sprinkled with dazzling diamonds whilst still wet. The effect is hard to see here, but they looked brilliant! I would love to know your thoughts, so please leave a comment too! I cannot wait to get to convention!!! 3 whole days of creative, crafty goodness with hundreds of like minded people. Its a great time to make fantastic friendships, get to know those in my team who are far and wide across Australia. Last year was my very first convention. This year I know what to expect and I know that it will be amazing! I thought I would share with you these cute little roomie gifts I have made. When I saw them I thought they were so appropriate considering we would be travelling together! I saw the original project on a blog by Laura Mackie – a demo in the UK. Her blog is www.lauramackie.co.uk – she has an instructional video there too. If you would like to have a go at making them yourself click HERE to see how she does it! I stamped them with the I Love Lace stamp – soon to retire 🙁 I love that stamp! And used our in colours of Crisp Cantaloupe, Pistachio Pudding and Baked Brown Sugar – also retiring! Check out the retirement list by clicking on my shop link – some of those items have sold out fast, so hop to it so you don’t miss out on items up to 50% off! Have you ever thought about becoming a demonstrator! I has been fantastic for me! I love the social side of being a demo and the great new friends you make – all whilst doing what you love! It really is extrodinary! Not to mention the income! If you want to know more – feel free to contact me using the contact tab at the top of the page. I would LOVE to hear from you! See you all on the other side of convention!!!! 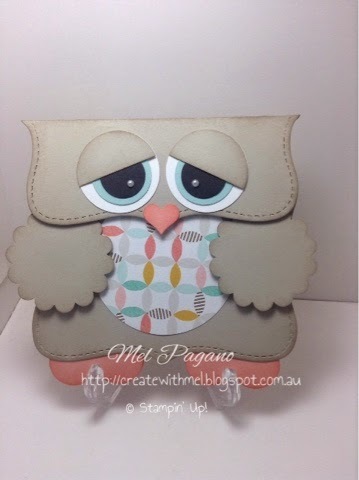 Hello all and welcome to our Eureka Stampers 2015 Retirement List Blog Hop. You may have hopped over from the talented Carly Middleton, or you may be starting here. Either way, hop on around and take a look at what our talented group has made to say a fond farewell to some of our favourites from the Annual Catalogue. The great news is that the brand NEW Annual Catalogue is on its way. So make sure you sign up to follow my posts by email (left hand side bar) and / or like my page on Facebook, so you can keep up to date with all the latest news – that way you won’t miss anything! My project is inspired from another in our team – Maureen Crameri. She made these adorable little boxes for our team day swap back in February. You can see more of her work here. 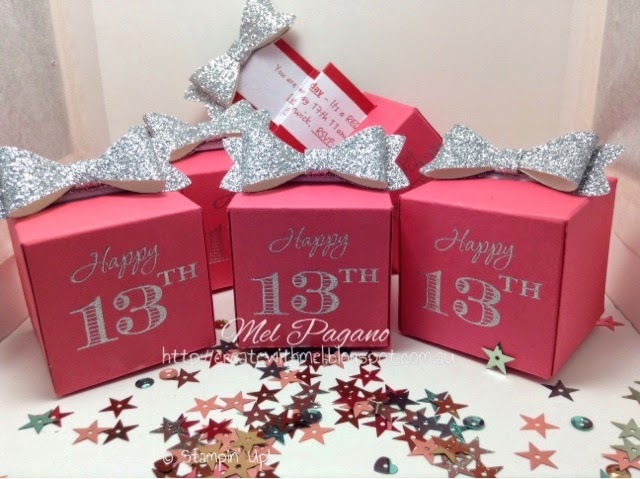 Fast forward a few months to my daughters birthday – she wants a Red Carpet Party – these gorgeous boxes immediately came to mind! A little birthday present where you pull out all the party details on a ‘red carpet’! I tried to talk her (my daughter) into using Baked Brown Sugar or a similar colour – but she was having none of that – so Strawberry Slush it is! One of our 2013 – 2015 In Colours that is retiring. I teamed that with our Silver metallic Ink to add some extra sparkle to the numbers from the Memorable Moments Stamp Set! All the important party information is created using our MDS program…all of which are retiring :'( I did add a little embossing powder in the end to brighten up the silver a bit more. 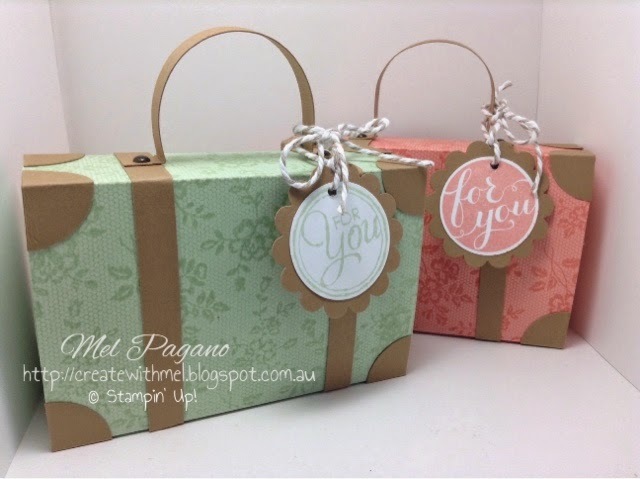 These boxes are the smallest boxes using the Gift Box Punch Board, with the folded corners simply trimmed to make a simple box fold. I attached the ‘carpet’ to one of the inside flaps of the box. The box is turned upside down for this project to work. I must admit – getting the folding right was the trickiest part of the box for that bow to sit just right! 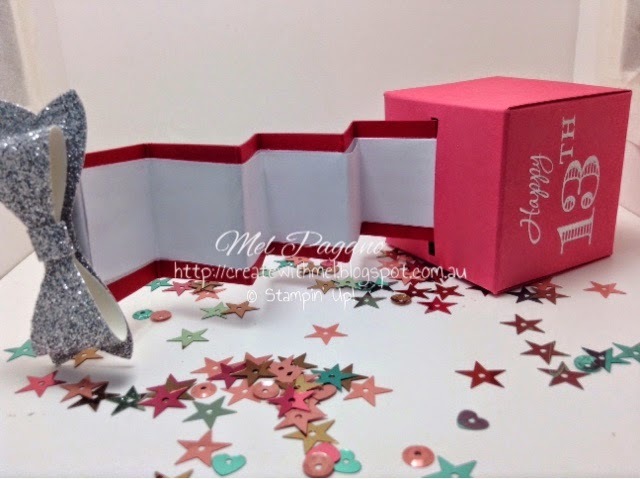 The bow is of course made with the Bow Builder Punch from the occasions catalogue, using silver glimmer paper. This is what the pull out looks like. Its attached to the one of the flaps at the base of the box, and the bow is what you pull to ‘drag’ the information out. I had to add a white strip to the red carpet so the information could be read clearly. Nothing worse than Party Date confusion! 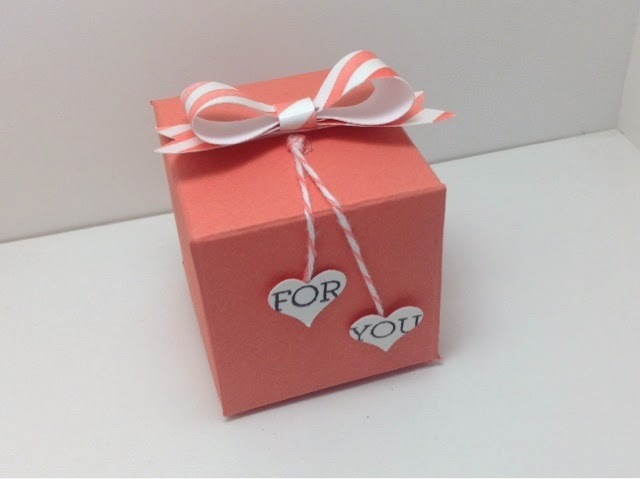 The box is made using the smallest measurements on the Gift Box Punch Board. I then added a small ‘slot’ in the middle square using a craft knife. Then trim off the ‘corner folds’ that help create the box, but leave approx 1/4″ extra from the score line on the left and right sides opposite the slot. I have completed one side in the picture below – you need to repeat it on the other side. Those 1/4″ flaps is what you will use to join your box together. I used a piece of our real red yardstick and trimmed it 1 3/8′ x 11 1/4″ (long length of card stock). I then scored it at 1″ intervals. I needed to trim off excess at the top end that joined to the bow. The main thing to watch for is that you can see all the information when you extend your strip from your box. I hope you enjoyed this. Don’t be too sad with all the retired products….just think about all the brilliant things that will replace them…..I CAN’T WAIT! 6. 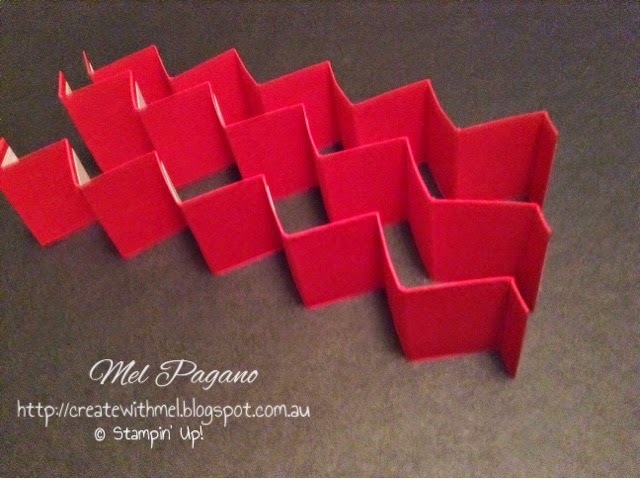 Mel Pagano – YOU ARE HERE! I absolutely adore owls … I have no idea why ….but I LOVE them! 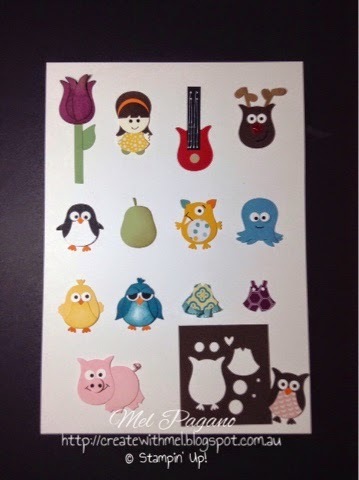 I have had a plan to make Bronwyn Eastley’s 3D owl using the Top Note Die for soooooo long now. Luckily I finally got around to planning the class for it this week, because the Top Note Die is on the retirement list. Isn’t he just the cutest owl you have seen! 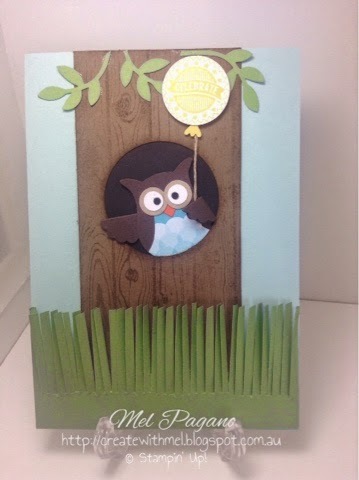 We also created a card using the absolutely awesome and amazing Owl Punch! Do you own it? Have you ever tried it? Here’s the card we made – i did end up adding some little flowers to the grass area to lift it a little. It was LOTS of punching out – but he pops out of the tree trunk and it looks really effective! What do you think??? Is it now added to your list of must haves! Now I’m off to attempt a unicorn for my daughter’s birthday….wish me luck! The retiring list has arrived for this year! An amazing List, with amazing bargains! But you had better be SUPER QUICK! With these discounts everything goes fast! Cant wait to share the new catalogue launch with you all in a few weeks time! So stay tuned….. I had a dear friend suggest this idea to me, so I thought I would give it a go! And Its so good to know we can get uses out of our tools other than what they are initially intended for – it really enables us to expand our uses for them. So a little nest was born out of the Bouquet Bigz Die from the occasions catalogue. 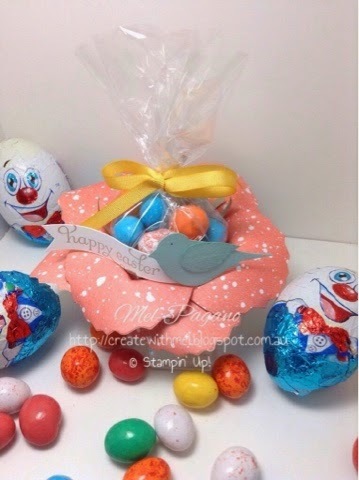 Matched with the bird punch and some easter eggs, its makes a very cute easter gift don’t you think? This was so easy to make. Using the same steps that we use to create the flowers from the Bigz Die (you can find more on You Tube from Stampin’ Up! if your not sure here)…I used 8 of the smaller flower petal. 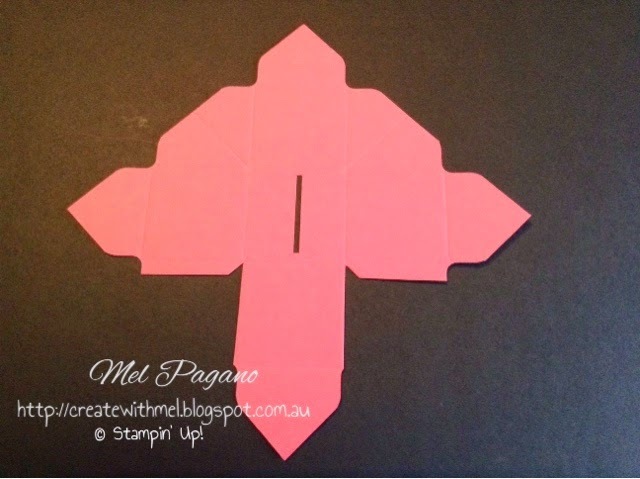 You will need 8 pieces of Designer Paper or Card Stock cut to 2 1/2″ by 2 3/4″. Remember that you can run 3 pieces through at a time with these steel dies…. I used four of them spread apart for the bottom layer and 4 glued closer together for the top layer. Add a bird punch and sentiment and you’re done!